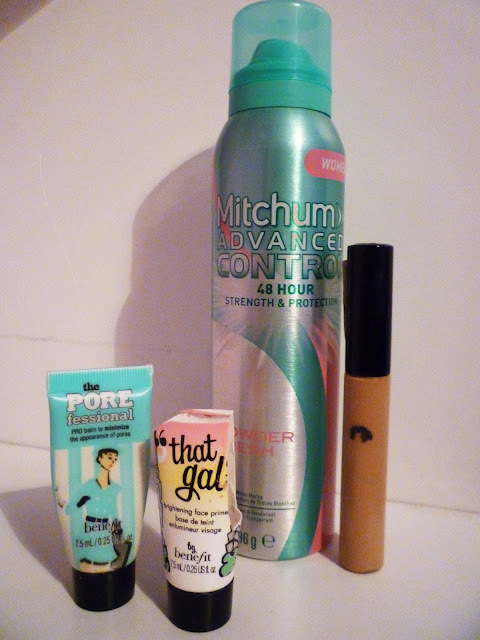 As far as anti-perspirant go,I don't have a certain preference.I normally just buy whatever is the cheapest or whatever is on offer at the time but after hearing good things about the Mitchum Advanced Control I decided to give it a go. This has lovely floral & powdery scent which I like, however it can be strong at times but it does keeps your dry throughout the day which is what you ultimately want from your anti-perspirant. This concealer is amazing & it's that good that I've purchased it over & over again since first trying it. The shade range isn't the greatest so if you have dark skin this concealer is probably no good for you. It has quite high coverage and I mainly use it to conceal spots but if I'm having a lazy day I use it to cover any dark circles under my eyes. Really cheap but effective. 'that gal' brightening face primer has a really nice,light texture. It evens out my skin tone, so much that I would be happy to just wear a bit of concealer and powder on top. It has a tackiness to it which makes my foundation stay in place all day on day's where I do wear a base, gives my skin a nice glow & it has a lovely bubble gum like scent. I would definitely consider purchasing the full size version at £21.50. This balm claims to minimise the appearance of pores, but I find that is also makes a really great base for foundation. Unlike 'that gal', the POREfessional has more of an oily consistency but it doesn't make your skin feel oily at all, if that makes any sense. You need less foundation with this primer but I don't think its necessary to have both the, 'the gal' & the POREfessional. Discounted Beauty Products - Where to Find Them!